The 3rd sock project today. 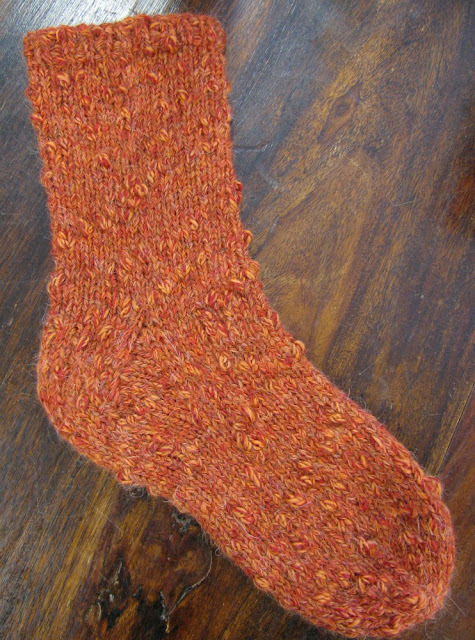 Baby ones here, Pennycress from Coop Knits Socks here. You've seen this yarn before - Karen's cardigan - this time its nobbly texture is knitted at a tighter gauge into a cosy sock. The pattern is free, and available on at Canadian Living website here. Its easily adjustable - if you want a longer leg or ribbed leg. Details in the pattern. 2 balls will do the small and medium sizes, you'll maybe need 3 for the larger sizes. Sock is a sample in the shop! We are not continuing with this yarn (we need to make space for new ones! ), so don't hang about if you want to knit this sock... or indeed Karen's cardigan.